Fortnite gave players a couple new ways to build for fun and victory in its latest update, not to mention some extra encouragement to stretch their last-minute engineering skills. 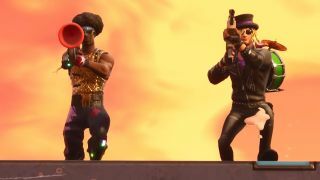 Think of the two new items added in update 5.41 like Port-a-Forts that have had some time to grow up and really decide what's important to them in life. Also to just get quite a bit bigger in general. Here's what you're looking at. A new Legendary throwable item for all Battle Royale modes, the Port-a-Fortress is exactly what it sounds like: a Port-a-Fort but bigger. It's the same basic design of a tower with a big set of ramps on top, but the Fortress features an extra protective shell on the outside to absorb some rocket blasts, bigger ramps, and a ring of Bouncers around the outside of the top to give you a quick escape route if necessary. All that and it still builds instantly! You'll be able to find the Port-a-Fortress in Vending Machines, chests, Supply Drops, and Supply Llamas. This thing looks so cool it's a shame you can only find it in Playground mode for a limited time. Throw down a Spiky Stadium and up will spring a 7x11 arena with an open field in the middle, surrounded by spike traps and bouncer pads (not to mention some spectator stands and field lights). Should be good for all kinds of impromptu shenanigans - and the fact that it spawns in red Supply Drops along with a bunch of Impulse Grenades may give you some ideas too. Otherwise, the biggest change in update 5.41 is actually a Storm nerf: Epic made the Storm Wall start destroying structures earlier this month, but now that change will no longer apply to the final few circles. In practical terms, this means you should see more of those old-school, climactic buildoffs as the final contenders worry less about the storm eating away their support beams. Looking for more Fortnite fun? Check out our buying guide for the best Fortnite Halloween costumes and accessories.